The thumbnails above show three different renderings of the October 23 partial solar eclipse. This was the view as seen from near Phoenix, Arizona. They’re all the exact same photo, but the post-processing was different. Click on them to see the full-size images. 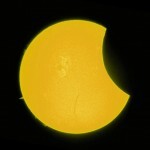 When I posted my official photo of the eclipse to our astronomy club website (Astrophotos page), my mother asked me if the Sun was really that “strange pinkish color.” I explained that the Sun’s true color is yellow-white, and how the color in my photo comes from a special filter I use when photographing the Sun. It reduces the brightness to a level that protects my eyes and camera. If you want to see what that setup looks like, see my June 11, 2012 post. Then she asked: Couldn’t you just use your fancy computer software to change the color from pink to yellow and make it look right? The answer, of course, is yes. That’s what I did with the middle image. As the art and science of photography transitioned to the digital era, the definition of what constitutes a “good photo” has also evolved. Back in the days of film cameras, post-processing was more limited. If you had your own darkroom, there were a few things you could do: contrast enhancement, cropping, “burning-in” specific areas of the negative, solarizing, inverting, and choosing either a color or B/W print. So what made for a good photo was mostly the talent of the photographer in selecting film type, camera settings, content, lighting options, and composition. You can still do all of that (except the film part) using a digital camera, but a whole new realm of post-processing has opened up. Applications like Photoshop, Corel PhotoPaint, and the free open-source GIMP provide almost unlimited post-processing capabilities. While digital cameras and post-processing software were still new, there was some debate among photographers about what was considered a “real” image and what was considered “cheating.” For example, a poorly chosen camera angle that resulted in the well-known “red-eye” effect could be corrected with digital post-processing. The red-eye could be removed, normal eye color restored, and the photographer’s error erased. Then, starting somewhere in the 2000s, more and more photographers switched from film to digital and realized how digital post-processing provided much more than just error correction. It allowed for artistic choices that were impossible using traditional film. Creativity was unleashed, and the line between “real” images and “fake” images became increasingly blurred. There’s a classic example in my November 19, 2012 post. So that brings me to my main point. Which of the three images above is the “best” photo of that solar eclipse? Left: This is what my camera “saw” and recorded. It’s the most “true” photo in that sense. And astrophotographers are used to that “pinkish” color as an artifact of an H-α (hydrogen alpha) solar filter. Right: This image was converted to grayscale, avoiding the color issue altogether. All relevant details can still be seen (sunspots, solar flares, and the overlapping Moon). In fact, lacking any color, the focus is on those details. I’ve seen all three options used by astrophotographers. It comes down to a matter of personal artistic choice. There really is no “best” photo. In each case, the essential details and information are present. Beyond that, what you see is art. But I do think that, when an image is significantly altered, it should be noted and explained, especially in a technical exposition. 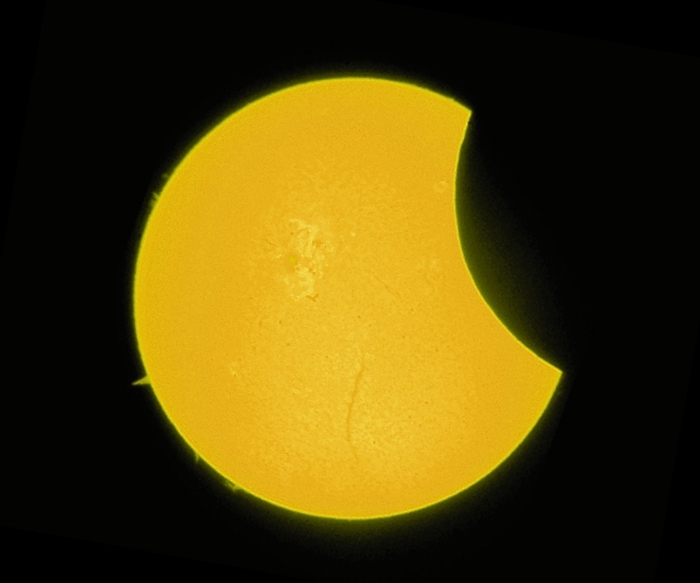 Case in point: When those spectacular HST images first started hitting the internet and other popular media, people were often misled about the true appearance of celestial objects. NASA never provided disclaimers like “false colors” or “colors enhanced.” These days, astronomers are more honest. See this image.